Though I truly desire to finish the Orion Code, I have not yet done so because my entire ministry is operated by one person: me. I am the sole proprietor of the Pillar of Enoch Ministry. I process every order and write every bit of correspondence. I wrote, formatted and published all of my books and articles. I maintain my POEM web site. I have written numerous articles and answer all ministry correspondence when people write to me with their problems, questions, prayer requests, and inquiries. I also have a family with its demands and severe health issues that have dogged me all my life, yet I have still single-handedly managed to write and design the covers for four incredible illustrated books with 2500 pages of information in them, and - for the orders I receive directly on my web site - I have managed to get them printed, packaged, and shipped throughout the world on my own. Another problem that kept me from finishing the Orion Code is that the information concerning the Orion Code is too great to fit into a 90 minute presentation, which is what I intended the Orion Code to be. I have tried numerous times to organize the information in such a limited time frame, but have been unable to do so. 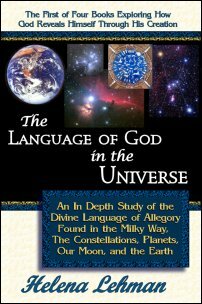 Then I started doing my Armageddon Radio Shows at the Edge AM, which are free to the public and reveal a wealth of knowledge surrounding the Gospel in the Stars and Sacred Astronomy. In fact, almost all of the shows I’ve done are based on my findings while researching the Orion Code. Unfortunately, these shows took much more of time than I could have imagined. I’ve devoted about 18 hours of my time to actually doing the shows, and about 20 to 30 hours of preparation time into each show. What I have found doing these Internet Radio Shows is that my frustration in trying to finish the Orion Code has been compounded by my speaking abilities. It was my voice that was to supply the narration for the Orion Code slide show, and if you watch my latest Armageddon Show videos that went from audio to video a couple of months ago, you will see that I often have a cough or stuffy nose that makes speaking fluidly a problem. I therefore have not been able to produce a sound track that did not contain sneezing, coughing or wheezing! 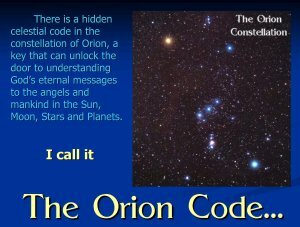 Also, based on doing my Armageddon Radio Shows, which have been unscripted for the most part but that reveal many details of the Orion Code, I think that my Orion Code presentation would end up being far longer than 90 minutes. In fact, I now realize that what I thought would be a 90 minute show would be about 6 hours if I wanted to include all the details surrounding it! Though my first 4 live shows were audio only, the remainder of the 13 shows I’ve done to date were done as streaming videos, so there is much visual information in them as well as audio. Now, though the Orion Code presentation will end up being more like six hours rather than a shorter 90 minute show, I would still love to finish the Orion Code before the Rapture. That is partly why I have kept delaying notifying people that it wasn’t finished yet. Another reason is because I have had to use much of the money I earned in prepayments for the Orion Code to survive, as my ministry is not well-funded. 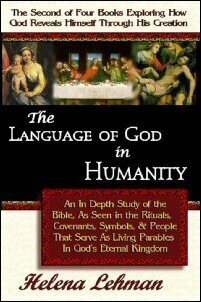 For the past 6 years, I have scarcely earn more than $150 a month in book sale revenues - even though I have spent from 45 to 65 hours a week in full time writing and researching for my ministry. And until recently, I received very few donations. However, though I want to finish the Orion Code and will continue to attempt it, the reality is that I may have run out of time. 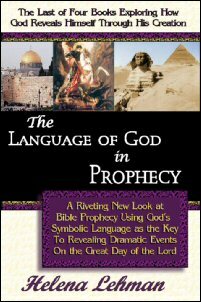 I am certain now that the Rapture will happen very soon and I will not have time to finish the presentation after that because it’s my hope that I won’t be here, and it’s my hope that everyone who has read my books and articles won’t be here either because we’ll all be celebrating the Wedding of the Lamb in Heaven! So, at this time, I am sending this letter to everyone who ordered the Orion Code and am asking them to download, watch and listen to my Armageddon Radio shows as an alternative. The show I devoted fully to the Orion Code was done on May 26th, 2010. However, this show was before I actually had the skill in using the software I have to show graphics from my desktop, so it is not that easy to follow. But all the shows I did after that are much better because I figured out how to do show graphics from my PC instead of printed graphics, and my ability to do so has improved with each show. 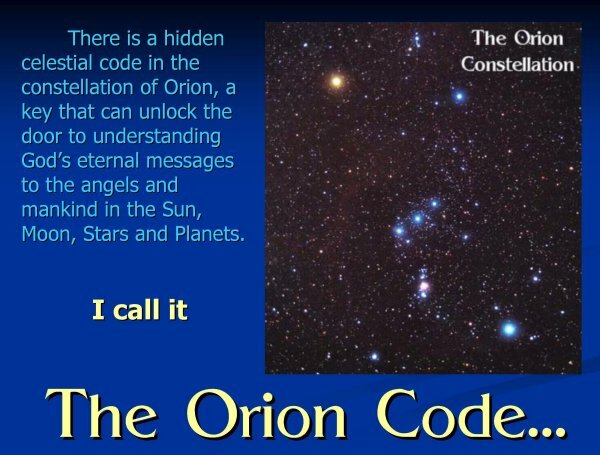 I also cover much of the Orion Code in subsequent shows, so they are all worth watching. If, after receiving all of this audio-visual and written information for free, you are still not satisfied, then please request a refund and I will be happy to oblige you as soon as the funds become available to me. Thank you for your patience and understanding. I hope you will watch my shows and download my books and that you will find this to be suitable compensation for pre-paying $30 for a delayed presentation that really should be sold for far more because it will end up being at least 6 hours if I ever have the time to finish it. 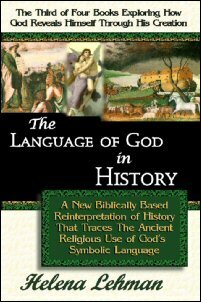 Until the Orion Code is finished and shipped, if you are so led by the Holy Spirit, please consider the funds paid to my ministry as a donation well invested. However, I will refund your money if you wish me to do so. Please let me know soon.